Investing in residential real estate and navigating the property market can be challenging – especially without prior knowledge of the potential pitfalls. Yet another one of the free books we offer that are designed to help you make smart decisions when it comes to real estate and property. 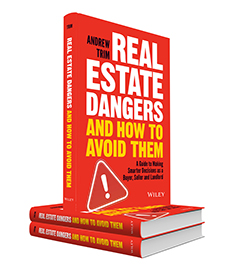 Written by Andrew Trim, Real Estate Dangers And How To Avoid Them is a guide to making smarter decisions as a buyer, seller and landlord. By shining a light on the flawed and unnecessary aspects of the real estate industry, this book will help you make smarter decisions based on knowledge rather than “advice,” saving you time, money and headache.